The Waterfront, also known as Cypress Hollow, is the place to be during the summer. Why wouldn’t it be? It’s hot outside! Campers enjoy the Guadalupe River in their daily swim class. Water Safety Instructors (WSI) and Lifeguards are certified prior to Orientation, and on day one, assess campers’ skills. Swim classes are divided by age division and then sorted into American Red Cross swim levels. Since staff changes yearly, your daughter may be placed in a different swim level than the year prior. Do not be concerned. Some campers swim throughout the year, others do not touch a body of water until returning to camp the following year. The skills assessment allows WSIs to provide more individualized instruction among similar swimming strengths. Campers work towards completing necessary requirements to pass the swim level during the term. Full term-ers are more likely to pass swim levels since they have more opportunities than split term-ers to achieve new skills. Instruction provides experience, but fun forms memories. 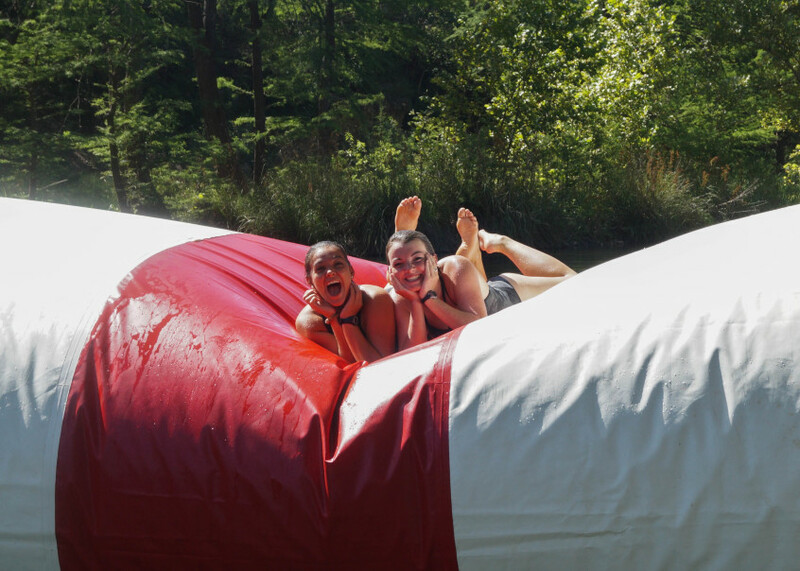 Swim class is interrupted with free swim, the water slide, and blob because camp is fun. Along the Waterfront you will also find classes such as fishing, canoeing, and noodle fun. At the canoe dock, campers learn canoe skills and can achieve the Swamper, Paddler, and Keel Master levels. Kayaks and stand up paddle boards are included in class instruction as an additional bonus. Fishing occurs at the original waterfront and campers catch mostly perch and catfish. They learn to string a pole, unhook a fish, and release it back into the river. Sometimes patience is the greatest lesson learned while at camp.